When chaos erupts, every person has choices. We can call it the worst time of our lives, wishing for the way things used to be and resenting the changes that have been forced on us. Or we can say, “This can be a positive time in my life. I didn’t choose the crisis, but I can choose to learn through it.” Making Sense When Life Doesn’t is about making your life better—not in spite of, but because of the adversities you face. Life won’t ever be perfect, but it can be good. It can be exciting…better than you ever imagined! Out of his lifelong pursuit of God, Cecil Murphey shares this collection of meditations and spiritual truths. Well-known for turns of phrase that startle readers out of “common wisdom” and into uncommon reflection, his sayings will surprise you in mind and spirit as you weigh the truths they impart. Beautifully written and laced with stunning photos by nature photographer Betty Fletcher, beloved authors Cecil Murphey and Twila Belk fill this book with gentle wisdom and personal stories that offer the caregiver practical help, sweet encouragement, and holy inspiration. Piper draws on his own firsthand experiences with the joys of Heaven—as well as the lessons found in the Gospel—to offer a set of "departing instructions," helping readers face the inevitable battles ahead, prepare for eternal life, and, starting today, live a happy, fulfilling, purposeful life on Earth while preparing for the glories of Heaven. Heaven Is Real chronicles lessons Piper has learned from his visit to Heaven and his recovery from the accident through 24 specific life lessons he has dealt with since. 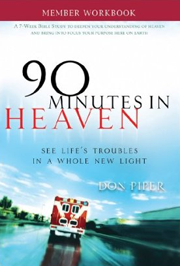 A seven week guide to a deeper understanding of heaven based on Don Piper’s experiences detailed in the book 90 Minutes in Heaven.